William Penn’s “Holy Experiment” was an effort by Quakers to establish a community for themselves and persecuted religious minorities. The place was what would become Pennsylvania; the beginning was Philadelphia. It’s hardly surprising that a city with such status in the birth of America would have so many historic churches, and they’re still in service. 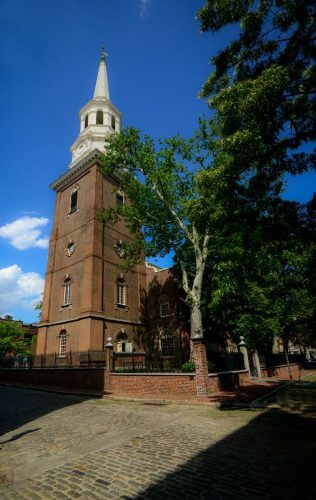 Founded in 1695 as part of William Penn’s charter, Christ Church is tied to the history of Philadelphia and the new nation that followed. George Washington, Betsy Ross and Benjamin Franklin all attended. Other patriots and 15 signers of the Declaration of Independence also worshiped at Christ Church. Although the church (built in 1727) went through alterations in the 1800s, much of its original appearance remains today. Tour groups are welcomed for talks and tours of the church and burial ground. Dating from 1698, Gloria Dei Church, also known as Old Swedes’ Church, is the oldest surviving building in the historic boundaries and the oldest church in the city. A member of the Episcopal Diocese of Pennsylvania, the church is located in South Philadelphia. By 1704 the walls began to bow and a sacristy was built on the north side and a vestibule on the south. Through multiple challenges the congregation continued to grow, and a renovation was completed in the 1846. The building was restored in 1999 but remains essentially unchanged since 1846. 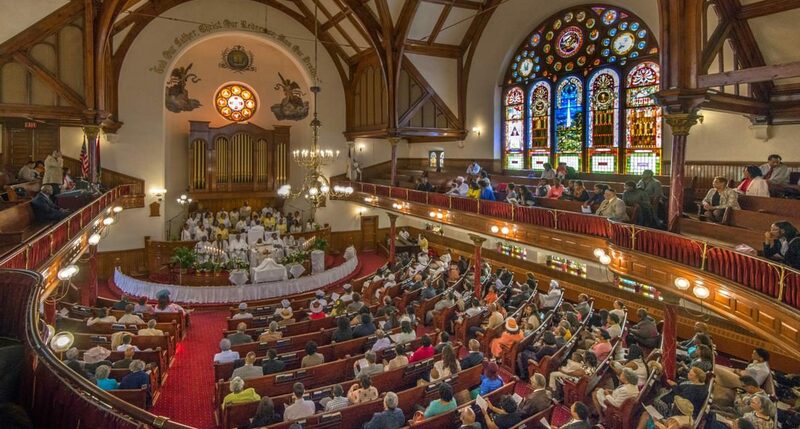 Mother Bethel African Methodist Episcopal (A.M.E.) Church, one of the country’s oldest black congregations, was founded in the late 1700s. The current building dates from 1890. 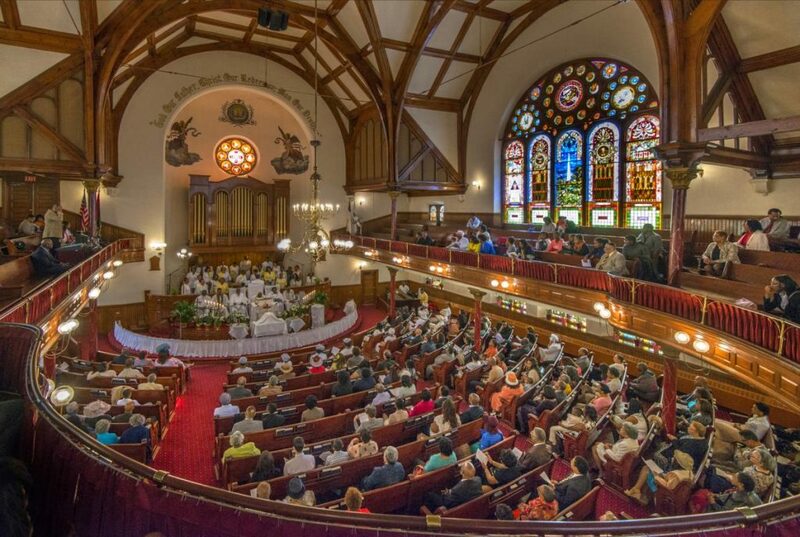 Founded in 1794 by former slave Richard Allen, Mother Bethel is one of the oldest African-American churches in the United States and the country’s oldest continuously owned African-American property. The land was purchased three years earlier with the help of financial backers including George Washington. Allen preached in Philadelphia but was becoming unwelcome in white churches due to his large following. The building that sits on 6th Avenue, the congregation’s fourth, was dedicated in 1890. Worship services began in 1761 in a building set on land donated by William Penn’s sons. The interior of the church, an offshoot of Christ Church, looks much like it did in the 18th century and features a stunning pulpit. Many Founding Fathers worshipped here, including George Washington on several occasions. The large cemetery is the final resting place for several Founding Fathers. Great museums are an important part of the Benjamin Franklin Parkway, but the Cathedral Basilica of Saints Peter and Paul on Logan Square should not be missed. With its oxidized copper dome and brownstone exterior, the church has an unusual look for a place of worship but blends with Philadelphia’s architecture. The beautiful painted ceiling lends itself nicely to the striking interior. Construction was completed in 1864 at the height of the Civil War. As the main cathedral of the Catholic Church in Philadelphia, the cathedral welcomed Pope Francis in 2015 and Pope John Paul II in 1979. Founded in 1768 as the Third Presbyterian Church of Philadelphia, this is the city’s only Presbyterian church dating back to the American Revolution. Its pastor served as a chaplain for the First Continental Congress in 1774. Jared Ingersoll and John Adams were notable attendees, though many Founding Fathers were known to have passed through the church, known as “Church of the Patriots.” The British used it as a hospital during their occupation. The beautiful cemetery was a filming location for National Treasure, a 2005 Disney movie. To discover more historic Philadelphia churches, begin at visitphilly.com.